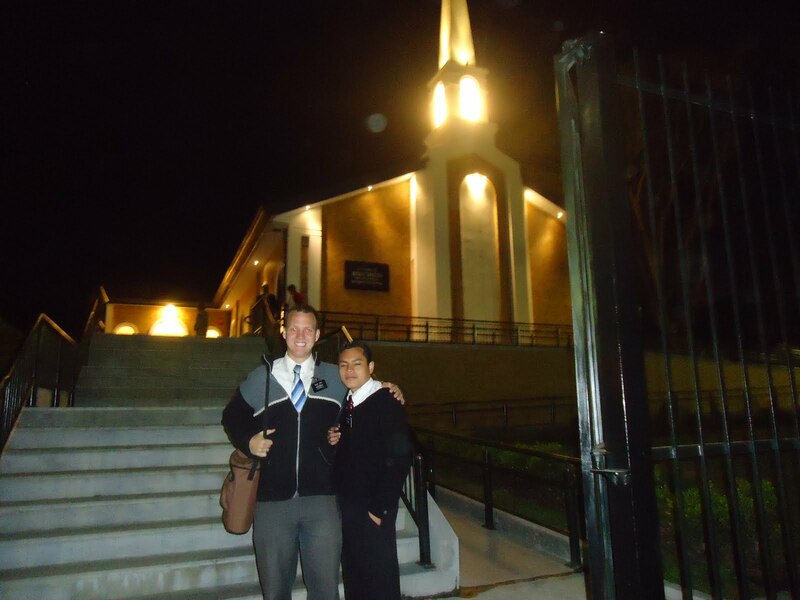 Elder Parry is "Speaking in Church" on Feb. 26th Sunday! 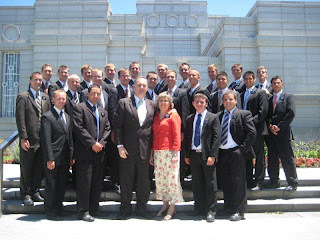 Thank you for reading Elder Parry's blog. He will be speaking in church next Sunday, Feb. 26th at 1:00 pm. Directions follow or call us if you need more information: 801-572-7466. Elder Bryan Parry will be speaking in church at 1:00. Please come over for refreshments after Sacrament Mtg. Directions to the church: Take Bangerter west from I-15 to 13400 S, turn W. on 13400 S to McDonald's (50th W). Turn left (South) and stay on this road until you reach the top of the hill. The church is one block past the 4 way stop on the left. Parry's House: We live right across the street from the church. We live South of the church in the Juniper Pt. neighborhood. Turn in on Alpine View and take a quick right on Desert Sage. Our address is 14624 S. Desert Sage Drive. 801-572-7466. I assume everyone's waiting for the epic 创final email of elder parry创 but I honestly don't know what to say. My mission is ending and it went really well. This last week has been really awesome. Really really hot, but awesome. I'm excited for the snow and all that good stuff. I'll see you all on Thursday and I can tell you more about what's going on. I'll be figuring out some good stuff for the country report. I've already got the clothes and such to show off, so I'll be looking at coins and other stuff to show. It'll be really cool. I kinda just wanted to take advantage of the fact that these emails/blogs are being recorded to share my testimony. In all my life, I've felt that the church was true and that God lives and I heard the stories my whole life of the prophets and the miracles that we read in the scriptures. I always...believed the stories, but I didn't have real...faith in their promises yet. I had the sensation that they were true, but didn't know what they had to do with me. When I was in high school. I really dedicated myself to find out if the Book of Mormon was true and have a firm testimony and in several occasions, I felt spiritual confirmations that it was true. I did a lot of stuff in the church. Going on Sundays, mutual night, firesides, campouts, efy, etc. and that helped strengthen me, made it so I didn't fall (too hard), but not until I got to the mission did I learn what the importance of all that was. 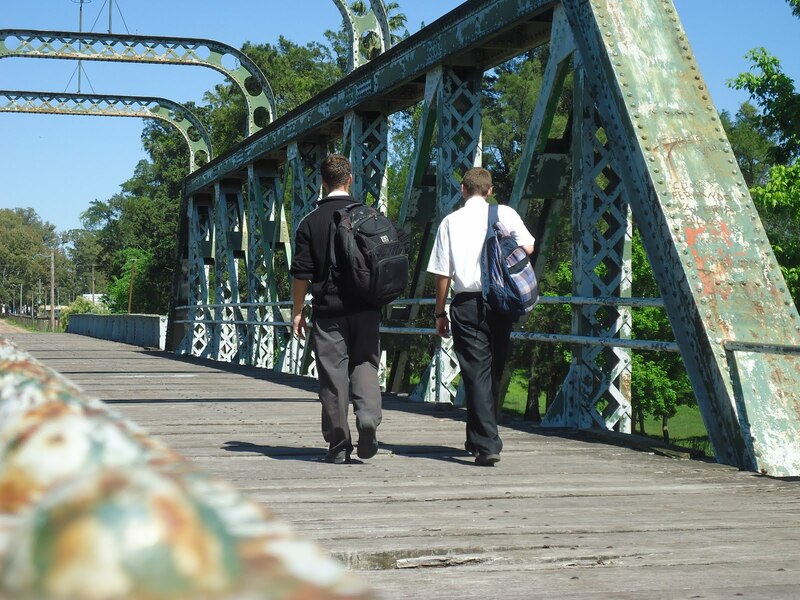 Why do young men's leaders care if young men go to mutual? Why do people go to efy? Why do sunday school teachers work so hard to get their kids into the class instead of the couch in the foyer? They're questions that many people ask themselves, but I got to the mission and I figured it out. All we do in the church is to help us get home. They're tools the Lord has provided to help us through this mortal probation. I know the church and its organization is perfect. The men and women who are called to run it are inspired of God to know how to best help the people under their care. I've learned a lot about goals. God helps us progress toward eternal life by setting shorter stepping stone goals--baptism, recieving the priesthood, going on a mission, etc. When we get committed to achieve these goals, the Lord blesses us and while we're in the pursuit of these smaller goals, we realize looking back that we got a little closer to achieving the ``work and glory`` of God to achieve 创immortality and eternal life创 I know now, through study, prayer, and application at least a little bit of the how and why of the gospel and my testimony has increased in size and power. Now I'm excited to get home and keep working in the Lord's work and apply all the things I learned here in Uruguay. Love you! See you on Thursday! Now the Lord of peace himself give you peace always by all means. The Lord be with you all. The salutation of Elder Parry with mine own hand, which is the token in every email: so I write. The grace of our Lord Jesus Christ be with you all. Amen. been finding tons of people that have all accepted baptismal dates. well. I'll have to just go snowboarding to see it. ask him about details so I can start packing today. Sounds good for the release time and sacrament meeting talks and such. know I'm willing to help out in any calling. anticipating changes in the ward or with our investigators. area and then one where I'm basically planning my first week home. haha. It's getting pretty close. I'm almost going home. I gave my valiant testimony in the conference. out what happened and what I should do. conference, so it's usually just the valiant testimony. Martha and Heber probably. I don't know who else I would visit there. then Dallas, then Salt Lake City. Lord Jesus Christ be with you all. Amen. Another good week. Lots of heat. I finally gave in yesterday and put on a hat. I've been using lots of sunscreen (SPF 90+) but it got to the point yesterday that I really felt like I needed to have some shade on my head. This is the heat we had last year at Christmas time. Summer's just a little behind schedule this year, which is nice. The worst part of summer is toward the end, so I'll get to miss that. Rather, I won't be here for the heat...I won't miss it. We've been having some rough times with our investigators who don't go to church. We have a lot of people to teach and it's being really good, but they just don't go to church. Melo just has a really laid back atmosphere and everyone says, ´´I'll definitely go to church. That sounds great!´´ and they don't go. It can get frustrating. Yesterday the only investigator we had in church was Mario, the deaf-mute...´´husband´´ of a member. They're not technically married, just living together. Mario legally can't get married because his parents declared him insane when he was little. He's now in legal battles to get his legal rights. But the Sister is seeing some progress. She doesn't have all of her membership rights (disfellowshipped?) because of the situation but she's really active and wants to fix things. She took the decision the other day to split up with Mario if they couldn't get the marriage thing figured out. The minute she was praying and said she was willing to do whatever it took to get her rights back, a Seventy called her and told her that her paperwork were being transfered to Salt Lake to be reviewed. There's a really good chance she can get her rights back and this Seventy is a lawyer, and he can figure out how to get them married. It's been really cool seeing all this happen. It was a big testimony to me that God hears prayers. Sister Julia told us that she prayed for hours thanking God, even though she didn't understand most of what the Seventy told her. She just knew it was good and that God had answered her prayers. It was awesome. Anyways, things are pretty tranquilo around here. Tomorrow, I've got Zone Leader council for February which I love. It's probably my favorite part of being a Zone Leader. We have really good discussions there and learn a lot. It's just 24 Zone leaders, the assistents and President and Sister Da Silva. Then Sister Da Silva makes us lunch and it's always really good. So yeah...vamos Arriba! 12 hours on a bus round trip! It's all worth it. In other news, all the missionaries and members are starting to realize how close I am to going home. People are asking what I'm gonna leave them and sell them and stuff like that. There's an RM in our ward who holds up his fingers every week to let me know how many weeks I have left. It's really funny. It's getting close. I'm getting pretty excited, but there's so much stuff to do here, it's hard to even think about that stuff. It's weird that people are already committed to going to my homecoming. I can't even get an investigator to come to church if they commit to go on Saturday night, let alone 19 committed 4 weeks before. Utah is a very different place than Melo. Anyways, I don't know if there's much else to tell. Talk to you next week! Much Love! normal, except for one thing: I finally got to go to Rio Branco! them. The ward is doing a lot better now than it was when I was there. get a break from my area. with the leaders of our ward. (Still not much lunch, but oh well. lots of good changes. We gave talks yesterday and it was really good. baptismal fechas (dates) for February. be. I've heard it's not really that cold there though. Is that true? could be hotter, just because it's farther north. and I'm gonna endure to the end. That's what it's all about, right? is nice. We also finally got Fernanda, the sister of Lucas baptized. Unfortunately, they went out of town again and couldn't get confirmed. don't seem to know any one anymore. Oh well. So it is. about what the mission was like 20-30 years ago. I love it. too. That's awesome. Hope it keeps going up. my final missionary planner today, so...pretty crazy. interview and stuff, so I'm pretty excited. Hope everyone has a nice week and I'll talk to y´alls next week! second (and last) comp that's faster than me. Jan. 9, 2012 Melo with Elder B Bryan is now a "Valiente"
Wow! Sounds like big news on the home front! New Ward! New Calling! I mean. And don't worry. I didn't laugh. I know you can do it, ma. Elder Moffitt. He's been a really good comp and really good friend. He's now gonna be the Zone Leader of the Assistents. in Durazno, including Elder Dinkel that I lived with. He's so great. So yeah, I'm really excited. It'll be a really good last change. say it's worse getting more into January, so we'll see what happens. act, not to be acted upon. Have a nice week. Talk to you on the flip side. Happy birthday Grandma! I've been thinking today of what a great influence you have had on me! mission...and on February 18. So yeah, that made me kinda trunky too. while, but have lost his address. out of town, but we passed by on Saturday at about 7:30 and found her. some Lechon...pig? Pork? and heated it up in the oven and ate that. wouldn't have been able to sleep anyways because of the fireworks. really awesome. Are we kinda on a corner or a...bend...thing? Wow, sounds like Grandpa's gonna be living in luxury. That's awesome. mission in baptisms this month. We tied with 33, so I'm pretty happy. the only new guy in the ward. the cyber at the same time as us. How are me and eler moffitt getting along? Really well. Will I be a valiente at changes? Yes. My final change is about to arrive. Travel to Montevideo? Not till next week for zone leader council. So yeah, I'm trying to get some pictures on, but they're not working. Nope. Might have just figured it out! see it is our Christmas tree covered in glowpaint. not as bad as last year. I'd love to go to Jayna's sealing! I've never been to a live sealing! the 26th and getting it out of the way! Another awesome week in the mission. It was pretty normal, nothing special, but...I'm a missionary, and there's no such thing as a bad week. Everything's going pretty well. Shisel went to church this week, which was really hard for her. (Part-member family, inactive) but she went with her aunt and it was awesome. This wednesday we have our Christmas conference as a mission. It's awesome because it's the only time that we do stuff as an entire mission. Each zone prepares a musical number. We're probably doing an arrangement/translation of O Come, O Come Emmanuel that I did, so that'll be really exciting. It's really fun seeing all of the mission, including those that go home soon. (Thornton is leaving early, I heard, so he can start classes or something) and elders Powell and Young that were all in the MTC with me, so it'll be really fun. I loved the christmas conference last year. Everything's a little more tranquilo. We just got the assignment today to read Jacob 5 before Wednesday. Fwa. That's some heavy reading for one hour of personal study. haha. IT'll be awesome. Wow, I can't believe Lon and Will are already coming home for Christmas. That's cool. 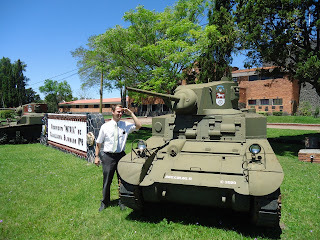 Yes, I would report to the High Council in the old stake and give a talk in the 25th ward. Speaking of neighborhoods, I found out Elder Robertson from my zone is from Herriman. Wooh. Yeah, later is better for the Skype probably. As fas as I know, we need to be home at 8 on the 25th, just like every other Sunday. I'm not sure. They'll tell us on Wednesday. We have church 11-12 so after that. What's Juniper Point? Is that our what our neighborhood's called? Weird. So yeah, i don't have much to....wait..Yes I do! I heard that Heber and Martha got sealed on Friday! I was super excited. The missionary that's in that area called us and let me know. I was so happy. I had heard that they weren't doing so well...activity-wise, but they made it! If they can go to the temple, anyone can! For those who don't remember them, they're the old couple that the husband can't walk because of a stroke and can't use his left side. Oh man, it's so exciting. I love them so much. Also, I heard from Vanessa from 33. She had had some problems and went inactive, so she never answered my letter, but now she's active and she wrote me. It's so amazing seeing fruits of the work now. Also in 33, I heard from Elder Heywood(Elder Draper's oro who took my place there and who just returned there as a zone leader) about a guy I reactivated and his wife that I prepared for baptism. Francisco, the husband is going to be the new patriarch when 33 becomes a stake. Sussel is in the District relief society presidency soon to be the Stake relief society presidency. It's so amazing hearing all this. That's all my big news for this week. My retention of my converts is actually a lot better than I thought, which makes me really happy! Anyways, times about up! Have a nice week! Sounds like everyone had a good week. Keep it up. We have had an amazing week. Casiano, his wife Fernanda, and their son Ramiro got baptized yesterday. It was a miracle. Casiano finally took the decision to make a sacrifice and not wait until the end of shearing season to come in and get baptized. Pictures next week...hopefully with pictures from the next baptism. We're trying to have a White Christmas year with plenty of baptism all month `round. We had a really exciting month in November as a mission. 150 people got baptized and confirmed. That's about 30 more than have ever been baptized in a month in our mission. Before I forget: Recipe ideas...not much. Empanadas de Carne are really good. I don't have a recipe, but they're pretty easy, i'm sure there's a recipe online. They're also good with shredded ham and cheese instead of meat. With the sopapillas (Tortas Fritas down here) put dulce de leche on them instead of the usual honey and stuff. It's amazing with Dulce de Leche. Also, if you ever think of making hamburgers, put a fried egg on the patty- it's delicious. Um...Alfajor....I don't really know of a way to make them other than how we made them before I left. I'd do that with dulce de leche(sensing a trend?) in the middle and put a chocolate covering on them. That's how they are here. The kind with out the covering are kinda weird and they put coconut all around the edge. I don't know what an Ojo de Dios is. I'm curious. Activities....the big activity for Christmas here is eating asado (kinda barbecue), playing soccer, and drinking mate and I don't think any of you would like mate very much. The difference is that it's hot out here. 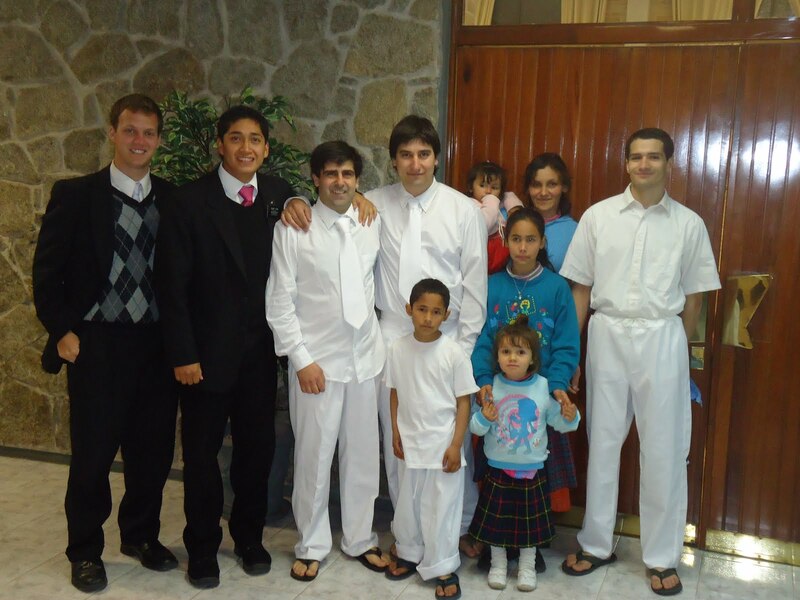 I don't really know why Elder Alldredge isn't psyched to be in Fraile Muerto. They're exploding the area. They already have baptisms planned for next week. and are finding tons of people to teach. The only thing scary about Fraile Muerto is that there's a little beach on a river that's pretty popular (imagine that place we always have to stop on the way up to logan...the first dam?) and there are lots of....jovencitas, but I think it's no problem unless the missionaries want it to be a problem. Re: Christmas. No one even seems to know Christmas is close. You've all started with some serious Christmas celebration. The church is barely starting to announce the activities. We didn't see the First presidency devotional. Didn't even know about it. It's kinda depressing. In montevideo, at least there were big sales and stuff at the stores. Here...nothing. It's really tranquilo. The heat isn't too bad because there's plenty of wind these days, but I can tell it's gonna extra bad here in Melo. that's what everyone says at least. Enjoy your Christmas and remember the reason for the season! Christmas will be good though. I'll still be with Elder Moffitt here in Melo, so at least I'm with a Utahn. Elder Alldredge and Elder Ladron de Guevara are getting whitewashed (leaving their area at the same time) so we'll be getting 2 new housemates, Elder Burnett and Elder Vera and we don'tknow them, so that'll be a good new experience. In other news, for Christmas, we'll be checking out Skype at our bishop's house next p-day to make sure it works. If possible, could you send me my Skype sign-on information? If not, it's no big deal, I'll just make a new account. Oh, just remembered. They did tell us that we need to limit the call to 40 minutes, because that's what it says in the mission manual. Thought i'd let you know now so I don't forget. Wow. I was starting to wonder when Lon was coming home. That's so crazy that he's already getting home next week. Also, I'd heard that Alex was getting home at the end of December. That's cool though. Congratulations, Valientes...er...valiants. I don'tknow if that term is used in other missions. Here, it means a missionary in his last change of the mission. Example: The elders who were one group ahead of me in the MTC are now Valiants starting tomorrow and I will be a Valiant next change. Wow. Time is still going really fast. Working hard and being focussed really pays off. Anyways, that's about all I have to say this week. Here's to another good one! Love you all. Have fun! Another good week. A little crazy like always, but really good. The work's going well. We're learning a lot about reaching goals and going the extra mile. Sounds like everything's going pretty well at home, in spite of some sickness and such. Hope everything keeps going up. (It's a mission phrase, I don't know if it's used at home. ``Go up``) But yeah. Hope all is well there. I have to confess something, mom and dad. I cheated on my christmas box. Yesterday, our lunch appointment failed and so did the lunch appointment of the other elders in our house, so we were all searching the house (including the emergency food storage) to find lunch and I remembered my Christmas box. So I started opening a little ahead of schedule (okay, a lot ahead of schedule) and found myself a nice lunch. Chef Boyardee Raviolis! Whooo! So yeah. I cheated and opened almost everything. I'm saving a little bit to open at the end, but even still, all the stuff you sent should still last me till Christmas...if not longer. I'm now good on all my razor stuff, etc. until the end of my mission. Thanks for everything! Yes, Elder Moffitt is the grandson of Jack and Val Moffitt. That's a really cool connection. I've actually heard a few stories about them. That's awesome hearing about the ward. Lately, Elder Moffitt and I have been missing Utah wards that work really well. Our bishopric is being kinda hard to work with and home teaching down here in Uruguay doesn't really exist...well, it does, but there's hundreds of inactive members and 1 companionship that actually does visits...and it's the elder's quorum president and a counselor in the bishopric...which doesn't really make sense, since one is an elder and one is a high priest, but oh well. We do what we can with what we have. My ankle is a lot better. I took a couple Ibuprofens a couple days and it stopped hurting, so that's nice. I don't know what happened to my first-aid kit I started with. I have parts of it and my roommates have helped plenty. That's kinda how it is on the mission. I do have my eyedrop kit with the instructions. I'm a lot better with my eyes now. I'm giving my contacts a break though. I've been using my glasses a lot more these weeks. I assume that'll help. That Disneyland trip is sounding more and more awesome. I'm super excited! (Do I use ``Super`` more than I used to? Did I say it before? Maybe it doesn't show up as much in email, but my comp and I say it a lot.) That's super cool...super bad...super sad...super awesome...stuff like that. Change week is coming up. My comp has 3 changes in Melo and I'm his 3rd comp here, so it's possible that he leaves. He has a year and a half in the mission and we're having a great time. Well, have a good week. Talk to y'all next week! Did you get your washer? We did get our washer to the house. It's not installed yet though. We send our shirts and socks and stuff to a laundry place to get it done. They wash it in a day or two and charge 90 pesos(a little over 4 bucks.) 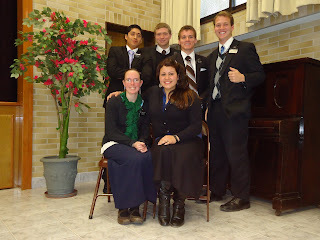 Then we have an hermana in the ward that helps us with the rest. Any luck on the Christmas package? Yep. It arrived. Way too early. I think I'll be adjusting the opening schedule a little bit if that's alright. Every 2 or 3 days one present. Waiting til the 7th is gonna drive me crazy. Anyways, sounds like everything's going on really well up there at home. Lots of fun stuff happening. Building up to Christmas time, baby showers, homecoming talks and such. Confession: More and more, when I have cool experience my mind just thinks, ´´that'd be cool to talk about in my homecoming talk.´´ Don't worry though. I'm not trunky. I'm fighting it. One really cool experience we had was that last Sunday we found a couple high school kids, Yoani and Jonathan that were really interested in listening. When we went back, they weren't there, but we ran into one of them in the street and he told us that he read the folleto (Pamphlet?) and really liked it. When we tried again another day, they couldn't talk very long, but they invited 3 of their friends over to listen and a couple seemed interested. Another cool experience was yesterday. We went to the hospital looking for Casiano's family because his mother is in the hospital. It occurred to us to go visit them and we just went, not knowing beforehand what we were to do. We didn't even know her name, but we went. As we were wandering freely around the halls of the hospital, compeletely lost, a lady came up to us and told us that her mother was hours away from dying and she wanted us to come in and say a prayer with their whole family. We said a prayer and started talking about the plan of salvation with them. Lots of them showed interes and we got some phone numbers to call them. Then we found out that the daughter that invited us was an investigator from another area and she told us that she would show the plan of salvation folleto to her family and talk about it, so we're gonna see if we can see from fruits from that. It was a really espiritual experience. So yeah, that's my week. Here's to another one. Hope you all have good experiences too. Love ya. It's been a really awesome week and a really hectic week, but awesome nonetheless. We did get to go to the temple and it was amazing. It was such a nice experience. The temple is about to close for a few weeks, so the people finishing their mission this change won't be able to go their last day, but we went and then had a really good zone conference. We came and worked in our area here in melo on thursday and went back friday for Zone Leader Council, which was also really awesome. I feel really included in the mission now. It's really nice being a leader, because we're the first to hear about stuff directly from President Da Silva. Ooh! Before I forget. An announcement we got in Zone Conference was that for our Christmas call, we can use Skype and do a video chat. That's really exciting. We're still working out the details because Christmas is on a Sunday and we can't go to the cyber on the Sabbath Day. We're gonna have to find some member with a decent internet connection and a webcam, but we'll figure it out. If we can't, we might consider asking permission to do it on Christmas Eve. We'll see there. So yeah, I'm super excited because I'll get to see the new house. Also...I think Skype gives the option of doing a conference call, so if there are people that can't get to the house on christmas, we can still do Skype all together. I'm gonna need to know my skype account information probably. It should be on my laptop still. If not, I can guess it pretty well. So yeah. That's my week. Zone Leading is going well. It's exciting. My area is doing pretty well. Casiano's family didn't go to church because they had some problems, but we're gonna be working extra hard with them to get them baptized. Satan is working pretty hard, but we're gonna work harder. I did get the halloween pictures. They were awesome! Did you get my pictures last week? Sounds like there's lots of good stuff happening at home. Keep it up! Do your home and visiting teaching! Go the temple as often as you can! (Which temple district are we now? Oquirrh Mountain?) Share the gospel! Fulfil your callings! Read the scriptures every day! Say your prayers! Help out someone in need! Enjoy the snow, while I'm here dying of heat! Well, it's been a really good week. I'm loving my life right now, but yesterday was kinda hard on us. Casiano, Fernanda, and Ramiro were supposed to get baptized yesterday, but Casiano got called to work out in campaña (country...farm stuff) shearing sheep and he couldn't come in to town unless it rained and the sheep got wet. We found out about this on Saturday afternoon and started fasting and praying for rain so Casiano could come to church and get baptized. No rain though. Guess this wasn't the week for Casiano's family. We're trying for this Saturday though. My comp is still awesome and we get along really well. I'm getting used to being Zone Leader. This week is gonna be interesting. We're going to the temple on Wednesday and travelling with the elders from 33. We're in charge of the trip, so that'll be kinda stressful, but i'm super excited. I miss the temple so much. Also Friday is Zone Leader Council, so I'll be in Montevideo for 2 days this week, which is kinda hard, but such is life. Sounds like everything is going well up there. Keep up the good work. So yeah. Life is good. I'm being very blessed and working hard. Talk to you next week! His e-mail address is "urumontemission@gmail.com" Make sure to put "Elder Bryan Joseph Parry" in the title line. It's been a really good week. A very welcome change. It's really nice being back here in Melo where I'm already familiar with a lot of stuff (the house, a few members, the cyber, etc.) and I'm with an awesome comp, Elder Moffitt. He's amazing. We're getting along really well, despite the universitarian rivalry haha. We're gonna have some baptisms this weekend if everything goes according to plan. We're really excited for this change. My roommates are Elder Alldredge(California) and Elder Ladròn de Guevara(Jewish French mother/Peruvian father, born in France, lives in Canada) and they're awesome. Elder Ladron de Guevara is our district leader and is doing a really good job. They both have about 8 months in the mission. Do I have to go to Montevideo a lot now? Yeah. We have ´´Zone Concilio (Council? )´´ once a month along with all the other stuff I had to do as District Leader, like leader training meetings and such. How far am I from Montevideo? Depends. Usually about 7 hoursish. I pass through 33 to get there, so that's cool. On the way up here, I ran into a couple of members I knew from there. That was cool. How many missionaries are in the zone? 16. Rio Branco is in my zone? Yes. There are two elders out there now and the ward is doing really well. There's no district leader there, so i might not be able to do interchanges to go visit like I thought, but it's nice to be close and to see how they're doing. I got the letters from Crescent View 25th today. Thanks everyone for your support! Hope everything keeps going well for you guys. Have a nice halloween. Enjoy fall while it lasts and enjoy the snow when it comes. It's raining here and afterwards it's gonna get really hot probably, so yeah..haha. that'll be fun. I'm gonna just let you know now, so you don't have to wait, what happened in the change call. I'm moving. Back to Melo. Rio Branco is in the same Zone, so I'll be able to go visit there on interchange days. My new comp is Elder Moffitt. I kinda know him. 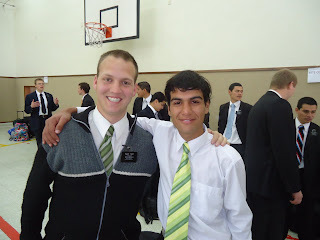 He's from Utah and every time someone hears about a missionary being comps with him, they always say, ´´I'm so jealous. Elder Moffitt is awesome.´´ so I'm really excited. He was with Elder Spilsbury for a little bit too, so that'll be exciting to hear how he's doing. The other big news is that I'm going to be a Zone Leader. President Da Silva called me Saturday night to let me know and to congratulate me. I'm really excited. I was getting to the point where I thought my time had passed and that I wasn't gonna be a Zone Leader, but I am. And in an awesome area that I already am familiar with. I already have slept in my new house several nights. The difference now is that I'm going to have a bed instead of sleeping on the couch or on a mattress on the floor. So yeah. This week has been great. We had stake conference this weekend with a visit from Elder Ruben Spitale from Argentina and he's hilarious. He talked about raising kids and said, ''Parents always say when their kids are small that they are so cute that they just want to eat them up....and then when the kids get older, they regret not having eaten them when they were little.'' So yeah. It was a really good conference. Pres and Sister Da Silva spoke too and it was really good. In other news, I did get the pizza. The Pedrozo family mentioned last week that we were going to get a surprise from the United States on Saturday. We wondered all week what it could be. Pamphlets from Church HQ? Copies of the Book of Mormon? A car? Then Brother Pedrozo called saturday and asked if we could recieve the surprise in the moment and I said yes. And then we got the pizza a little while later with a note that it was from the ''Perry Family, United States'' It was really funny. We were really excited...but we were fasting. So we ate it yesterday and a little today for breakfast. It's really funny because last night Bro Pedrozo called and asked about it and was really excited because they made special arrangements to find pepperoni because mom said I liked it. But the pepperoni here is basically salami. Still good, but not the same. I usually put bacon on my pizza here. So that was a really fun experience. And payment...I doubt we'll be able to figure out a way to pay him. He's really rich and likes giving stuff away. I wouldn't worry about it. He really does treat us like another of his sons. So yeah. I had a lot to say today, but just the half an hour, so I've got to go. I'm animated to hear about Disneyland! That'll be a nice welcome! haha. Do I like serving a mission? I love it. It's the best decision I ever made so far. So all of you should start thinking and planning for a mission. You'll love it! How many people have I baptized? I have taught 22 people and helped get them ready for baptism. (Not quite a hundred fifty, but I'm really pleased at the opportunities I've had to witness the changes in these people`s lives. What city am I in? For now, I'm in Durazno, but I might move next week to another city. Do I rent an apartment? Yes. 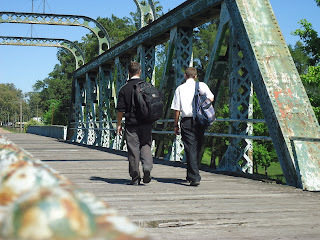 I live there with my companion and 2 other missionaries. What sports do they play here? Soccer. And nothing else. Do they have technology? Yes. Almost as much as we have up there in Utah. They're a few years behind, but they have cell phones and computers and everything. How's it going? It's going pretty well. What is the most slimy, yucky thing that I have eaten? Cazuela de Mondongo. It's a soup made of cow stomach. It's really not bad, but lots of people don't like it. And it's very slimy. 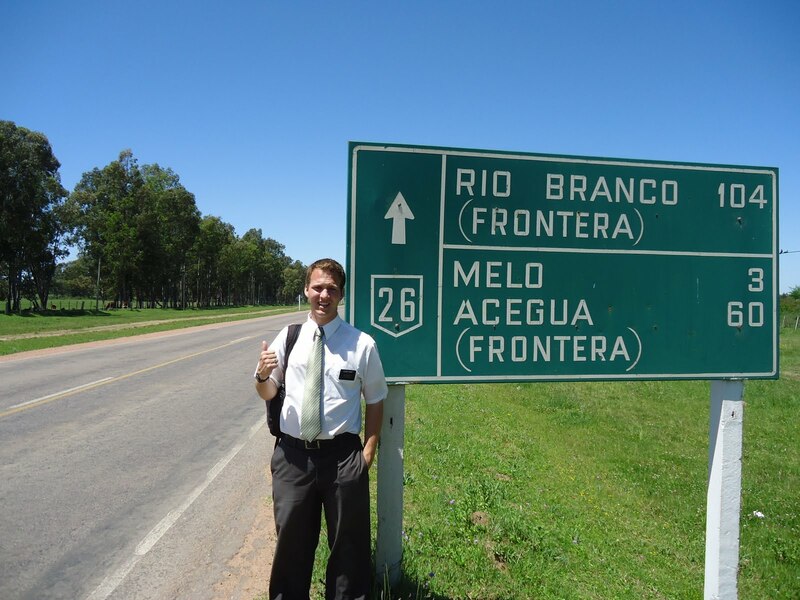 Is Uruguay a good place to go on a mission? It's the best place to go on a mission. I highly recommend it. How long will I be back? I'll be back in a little over 4 months. I'm excited to come meet all of you that wrote to me. Is it hard being away from my family? Sometimes it can be hard. I miss them a lot, but it's easy because I know they want me to be here and they know what I'm doing. How is it in Madagascar? I don't know. I've never been there. I hear Elder LeStarge is there. You could ask him. Am I learning any languages? Yes. I'm learning Spanish. I like it a lot. I'm also learning a little bit of portuguese. But the most important language to learn is how to pray and understand the spirit when Heavenly Father answers our prayers. Do I like Halo? Not really. I only played a little bit before the mission and now I don't play any videogames. Am I having fun? Yes. Did I see a friend? Yes. Lots of friends. Thanks for all your letters, kids! I loved reading them! Good Luck on the primary program! This has been a good week. Maria got baptized on Saturday and due to a last minute change of plans, her husband didn't feel ready to baptize her, so she asked me to do the baptism. It was a really nice experience. Lots of people went to the baptismal service. Something weird about the baptism was that everyone was congratulating me. I've never had that before. It was nice that people were recognizing the work i put in to help Maria, but I really didn't do that much. She was preparing herself on her own for months and finally was ready. We just arranged the service and reviewed the lessons that she already knew by memory. Magdalena didn't go to church or the baptismal service. We invited her to the baptism and she said she'd go, but didn't. Then she didn't go to church, but there's a chance she doesn't really know the schedule since it's changed every week since she's started with general conference and such. Yes, this week is change week. It is likely that I leave. I have 3 changes here and I've only had 4 changes once in Treinta y Tres, so it's not very likely that I stay. I'd love to stay, but if I do, that means I only get 2 changes in my final area and I wouldn't like that very much. That convert of Elder Bush is probably not anyone I know. His first convert was in Montevideo and he and I didn't have any baptisms together. Sounds like I missed the fall leaf tour. It actually kinda sounds fun now. Really calm, tranquilo relaxation anyways..something I don't get very often. In other news, all is well with my comp, my area, my ward, my house, my roommates, and such. I'm recovered from my sickness. My allergies still kinda bug me, but it's no big deal. I'm happy, healthy, and safe. Have a nice week all. And remember: The building up of Zion is a process as much as it is a destination. Let's get building! I absolutely loved conference. Conference is one of my favorite things nowadays. It's just time to listen and learn and figure out what to change about your life. And this one was especially fantastic. Favorite story: Elder Devn Cornish's story about finding a praying to find a quarter on his way home from work so he could buy fried chicken. Anyways, it's been a good week. I'm feeling a lot better. I didn't end up getting the nebulizer, but I'm fine. I'm not even needing my inhaler anymore. I still have allergy symptoms sometimes, but that's easy to control, especially since I now have 3 different types of allergy meds (Zyrtec that I brought with me, Allegra that the nurse told me to get, and Singulair which I use at night). So yeah. That trial is passed. I'm still tired (see picture attached), but for other reasons. Saturday night, we didn't get home until 11:30 because of Priesthood session that ended at 11. Then we had the time change and lost another hour of sleep. Shortest night of my whole mission. But yeah. That's why we have P-day, right? I'm excited to rest today. Re: the work. It's going well. Magdalena is doing awesome. She feels serious desires to make changes in her life, including ones that we haven't taught her yet. She has already put in practice some plans to get herself baptized. She wants to be a member so bad, but thinks it'll take forever to make the changes necessary, but we helped her see that her desire to be baptized isn't just her desire, it's His and He will help in any way possible. She went to the last session of conference yesterday, but left before we could talk to her. Also, exciting about conference: One of the families that we challenged to bring someone to conference brought their grandson Matias and he now wants to listen to us. Maria and Oscar went too, and Maria is getting baptized this week if all goes according to plan. Also, and investigator with a baptismal date just moved into our area and she went to conference with her boyfriend who is a recent convert from Centro ward. So yeah. Everything's going pretty well. We're excited for all the people who are progressing towards baptism. Yes, I read Pickles before the mission and really like it. That's cool that he served here. Yes, CityDeals existed before I left. I don't know much about them, but I know they existed. Yes, I would love to go to Disneyland! Hope all is well at home. Things are pretty much the same this week for me, except for the fact that i've been really sick. It's been a pretty hard week. I hardly slept for 3 nights. The pollen is really really bad here in Durazno, so I've had some really bad spring allergies...which in turn triggered my asthma. I started using my allergy meds that I brought with me, but didn't seem to help. The inhaler helped, but it didn't solve the problem because it doesn't let me sleep. I called the mission nurse and she told me to buy a different allergy medication to see if it helped. It didn't make much difference. I still couldn't sleep. I was kinda going crazy. I kept in contact with the mission nurse she called the Area doctor and they came up with other medication that is for both allergies and asthma (Singulair) and I went to buy it. It does help a lot. 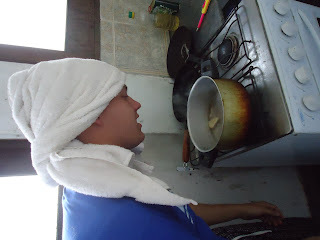 Also, I've been boiling water on the stove and inhaling the steam. The doctor told me I could put the equivalent of Vick's Vap.O.Rub in the water and it would help. Then it hit me....There's Vick's here? So I went and bought that and I've been sleeping a lot better. Last night I didn't get much sleep, but it's a lot better than it was. So yeah. That's my story. But no, no sign of parasites. I've never heard of a missionary in this mission with a parasite. I heard of a really bad infection once, but that was because an elder went in barefoot to clean out a nasty baptismal font that hadn't been used in forever and he had a cut on his foot. Supposedly, he was in really bad shape, but that was several months ago. Other news. Magdalena didn't go to church this week, which was pretty disappointing, but we did have a nice miracle at church. There's a former investigator and her husband(member) who showed up at church. She hadn't gotten baptized yet only because she and her 创husband创 weren't married, but she's been to church tons, loves it, and they got married this week. A counselor in the stake presidency introduced us yesterday and we basically decided right then and there that she could get baptized this weekend between sessions of conference. It's always nice have a little baptism fall out of heaven--one of those tender mercies of the Lord. Tomorrow we're having a special training meeting from Pres. Da Silva about working with members and we're pretty excited for it. It's something I've been trying to do here, but haven't really figured out how to do it yet. But here we go. Vamos Arriba! It's all pretty excitng stuff. I think I've mentioned it before, but it's called Level 3 of the missionary work. Level 1 is if we just work as missionaries to find and baptize people. Level 2 is when the members help us by giving references and accompanying us to lessons. Level 3 is called 创Missionaries helping members创 so we're learning how to teach and train members instead of bothering them about references. It's really just a change of attitude and how we relate with members. So yeah. that's my life--recovering from asthma, working with members, and trying to figure out how to get my comp to talk more. Have a nice week. Do your home and visiting teaching and fulfill your callings everyone! Wow, sounds like lots of good stuff going on at home! Thanks for the update on everything. It's nice to know what's going on. Wow, sounds like everyone's getting big on the technology up there. Everyone-s skyping all the time, I-pads, and such. I saw the equivalent of a Best Buy flyer here and it said they had TVs in 3-d. Is that true or did I misunderstand? Also, I saw a floppy disc at lunch yesterday. It was really weird and it got a conversation going about the future of technology and they said someday we would have all these things and I think they just described everything that the I-pad has, based on what newer missionaries have told me. And I thought: yeah, the i-pad has all that, but no one has them. Now I find out that the Wilsons have one. I realize now how out of it I am. Glad to hear on all the spiritual progress up there in the family and friends. Thanks for sharing your missionary experiences. Things are still good here with my comp and everything. We got an investigator to church, which we haven-t had in a couple weeks, so that was exciting. Her name is Magdalena, like Mary Magdalene. She told us she couldn-t stay all 3 hours and she-d have to leave early and I was kinda disappointed because she was gonna miss sacrament meeting, but she must have liked the classes, because she stayed the whole time. It was really good. We-re gonna get her baptized ASAP. I did see Elder Dame at change day for a few seconds, but didn-t talk much with him. Wow, sounds like life is pretty interesting there. That's awesome. Lots of changes and lots of good stuff going on. Same here. Change day went well. 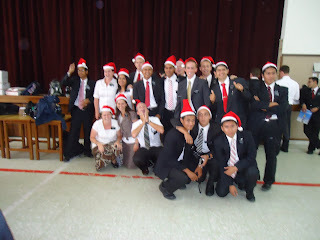 My new comp is Elder Ascencio from El Salvador, and is the one that I was thinking of. He is really really quiet, just like I remembered, but he's really cool and we get along really well. It's a nice break after Lopez who talked and talked and talked and talked and made it hard to get out of lessons and visits with members. It's kinda weird talking most of the charlas. I haven't done that since Elder Spilsbury when I was with him the first time. So yeah. Life is still peachy here in Durazno. 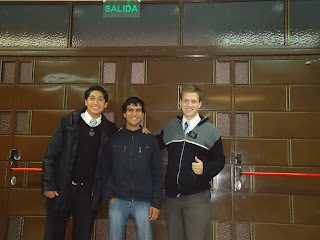 It's cool living with Elder Powell and his oro, Elder Aguilar from Paraguay. 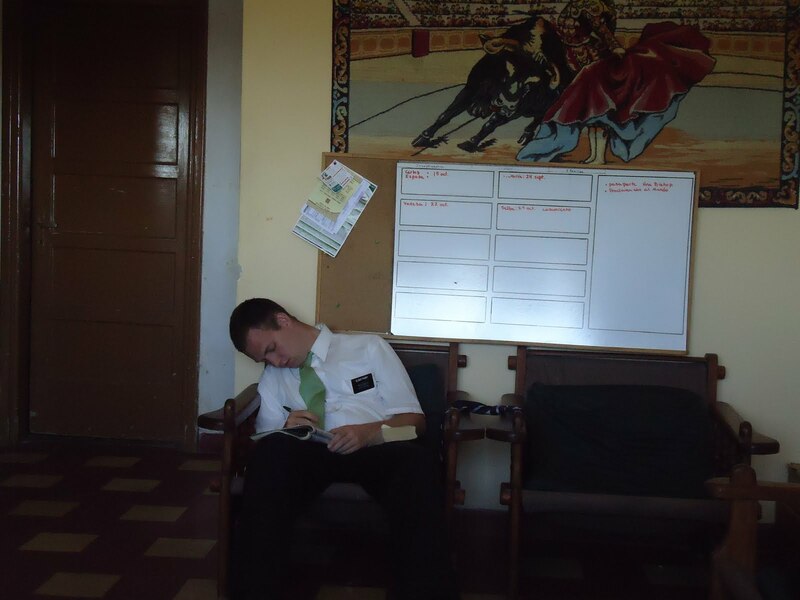 Aguilar is having a hard time adjusting to the mission and elder Powell. It's a really funny companionship because they're so different. Anyways, yeah. 9-11 has been kind of a big deal down here. Mostly people tell us that Discoverychannel and National Geographic are passing a lot of stuff about it. Other than that, there's not too much sign of it. But yeah. I just put some pictures to upload. 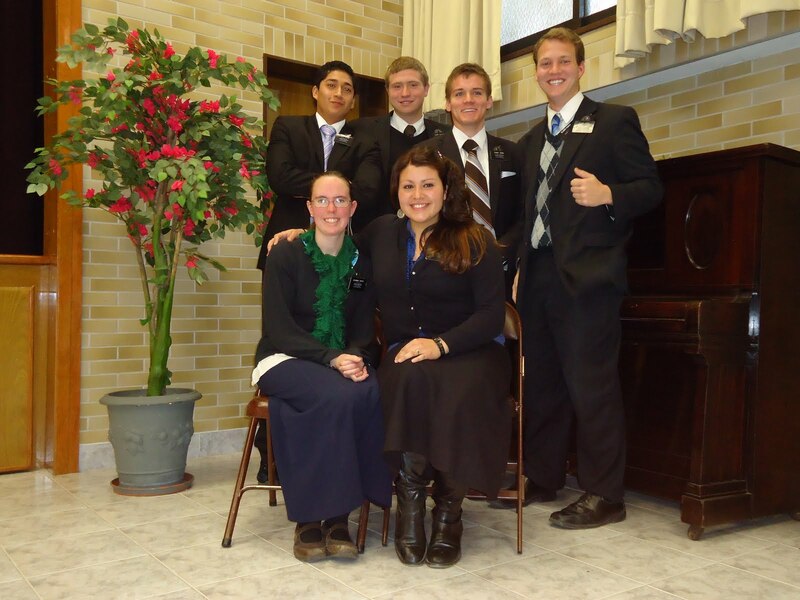 First is our district from last change Lopez, McLellan(ZL), Young (ZL), Parry (DL), Sister Parker, and Sister Campos (who is now at home in Chile.) The district this change is about the same as last change, but change out Campos for Sister Múnera and change out Lopez for Elder Ascencio. Second is of me and Carlos on change day. He finished his mini-mission and is now back here in Durazno with us. Bonus fact: I know all the people in the background too:(L-R) Elders Simpson, Gurr, Banegas, Peña, Ojeda, McLellan, and Padilla. Third is of me and Ascencio the night of the open house of the new chapel in Durazno (Not our chapel, the other one). Fourth is me in front of a barraca (Hardware Store?) 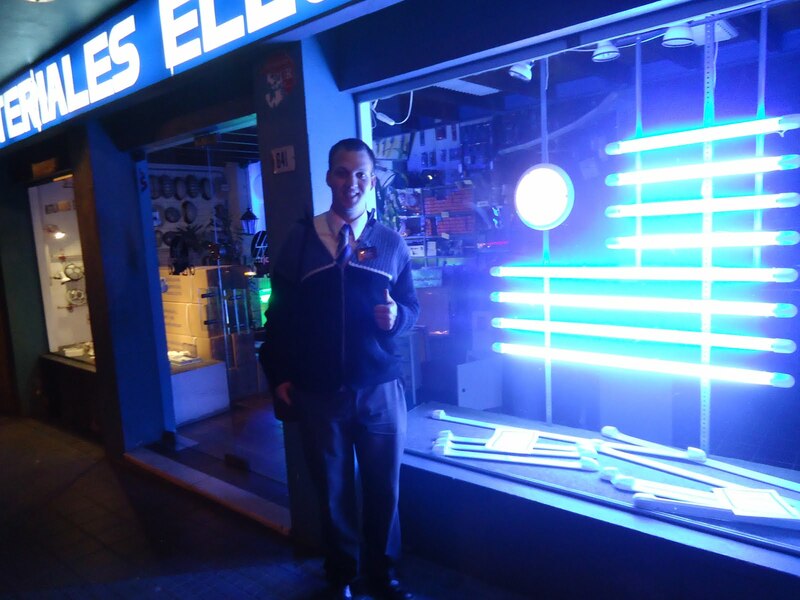 that arranged the lights in their window like the Uruguaya flag. Wooh! FWAA! Nate's going already! Wow. That makes me feel old. He's two years behind me in school and he's starting the mission. That means...I'm almost at 2 years in the mission. Congratulations Nate! Well, I don't know what else to say. I look forward to getting those letters from the Primary of the...shoot. I forgot the name of the ward. Aurora Vista Ward? Something like that? Anyways, hope y'all have a good week and enjoy the good life. P.s. Missionary challenge: Everyone who reads this letter should try to talk to one person who isn't a member about the gospel during the week. Another good week, as always. It's been hard dealing with the Colombians, but they had a baptism and we helped them do the baptismal service. I played the piano...kinda. I played the opening hymn(Come Follow Me) on my own and the rest were the ghost piano. I just played the rhythm. Still it was a lot better since I knew how to play and count and stuff. I guess you're all wondering what happened with the change call. I'm staying here in Durazno, like I thought. Elder Lopez is going to Montevideo, the poor kid. My new comp is Elder Ascencio, and if it's the Ascencio that I know, he's from El Salvador and he's really, really, really quiet. I went on a 20 minute bus ride with him once and he didn't say a word. So yeah, that's my new life. I'm excited though. Elder Powell and his oro are doing a whitewash in place of the Colombians that are going home this week. Powell has 6 weeks more than me and I know him from the MTC. He's awesome. He's probably one of my biggest heroes in the mission, so it'll be nice. Hopefully, they'll be in my district. I don't know yet. I am still District Leader. Another nice change is that we won't have to listen to the Colombians' techno and Brazilian pop music anymore. Wooh! So yeah, I don't think I have much else to tell. We're going down to Montevideo tomorrow morning to do changes and see everyone and have the leadership meeting. I got my haircut today and it might be my penultimate haircut of the mission if I do it right. It's really short. Well, here we go with another week. Hope you have a good one. Love ya. Chaucito! Yep, everything's going well here. We're finishing off this change strong. Change day is next Tuesday. Most likely, Elder Lopez leaves the area and I get a new comp. It's....somewhat possible that I leave, and it's very unlikely that we both stay or both leave. It's been a good week. We had David's baptism and it was awesome. The whole ward is just so excited. Usually when I'm in an area and I have so many baptisms, the ward starts complaining that we're just baptizing whoever we can find, but the ward is doing a really good job at retaining the converts and they're really happy. Yeah, I gave a sacrament meeting talk on Sunday. It went really well, especially since I prepared it in half an hour before church started because the bishop asked to me to give it while we were eating lunch with him that same day. Already had the trunky call. It was the day after you gave me the information the other time. I hardly needed any information. I think they only needed the stake name and our address. We have had some nasty rain this week, but not that much. I'm thinking rain week is gonna be extra light this year. It's supposed to be in August and it was last year, so..it might be done for since there isn't time for more rain. P.s. the pictures are kinda obvious. One is David's baptism. He was baptized by his friend Martin from the Hospital Ward...er...barrio hospital. It's not actually a ward in the hospital it's a normal ward that is named Hospital. 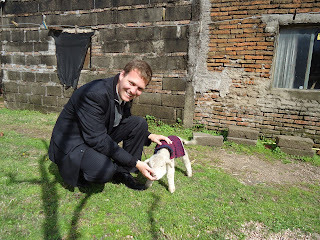 The second picture is me with a little lamb. I almost fulfilled Elder Draper's fondest dream to take a picture with a lamb on his shoulders. I didn't have the guts though. I thought it might pee on my suit if I picked it up. He is however chewing on my finger. Fun fact: Apparently lambs don't have teeth. Another great week. I feel really good about where I am in the mission. Year and a half, I love my area, we're having baptisms, good comp, and....yo que sé(What do I know?=I don't know) I'm just happy. Big news: Carlos, who got baptized a few weeks ago is now.....on a mission. Sorta. They called him to be a Corto Plazo(short-term) missionary. He's now serving in Montevideo for 3-4 months. We're really excited for him. They called him on thursday from the offices and he left friday morning. He's gonna have more time as a full time missionary than as a member. The ward really helped him out. The bishopric got together to find him a suit coat, shoes, preach my gospel, and the bible. He still doesn't even have a triple combination. It was so awesome helping him get ready to go. Me and Lopez felt like we were sending our kid off on a mission. He was so nervous...as well I would have been in his situation. He's still in second nephi. It's awesome though. Every new convert needs 3 things: A responsability, a friend, and to be nourished by the good word of God. What better place than the mission for all three. Lots of Responsability. Lots of friends. Lots of study time and a guarantee to be in the chapel every week, no matter what. So yeah. Carlos is doing really well. Margarita, who was going to get baptized, but didn't...is still learning. She wants to get baptized, but she needs to take it really slow. She's gotten a testimony that she needs to get baptized, but she doesn't really understand it yet. David, who was a new we were referred to last week is flying. 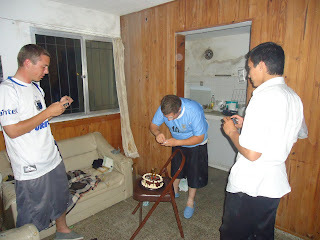 He'd already gone to the capilla with friends from the other ward and now he's gone 2 more times with us. He understands everything amazingly. When he went to church the first time before we even knew him, he decided that he had to quit smoking and when we met him, he had already quit and has been off cigarettes about 15 days now. He loves the church and is super excited to get baptized this Saturday. We taught the word of wisdom and tithing in the same charla and he told us that paying tithing would be easy because he's saving so much money by not smoking. He's just incredible. He studies in-depth the pamphlets we leave him. I've never seen an investigator so amazing. In other news, we're making some big changes in the mission...maybe not huge changes, but it's cool what we're trying to do. We're trying to, instead of always be asking references from the members and convincing them to help us do the missionary work, teach them how to do it. So I also invite you all at home to be member missionaries, even if you think you can't or you don't know anyone. House: It is kinda hard being the only gringo, but it's good. Yeah, we always speak spanish, unless Camargo wants to practice his english. He's the only one who knows any english and he's not very fluent. Actually...he's really fluent, but...only in slang. So yeah. That's my life. Our bishop(See picture of Carlos's baptism) is really great. They had a training meeting in Montevideo this last week and he's really excited to work with us. He asked me to give a talk on Sunday. That is, on Sunday, he asked me to give a talk on Sunday. So I prepared it in half an hour and it went well. It's so nice to have a good bishop who's excited about everything. He gave us a good plug for the baptismal service in sacrament meeting and now we're just giving out tons of assignments so lots of members will go. It's all very exciting. So yeah. Have a nice week. Another good week! Not much change. We've got a cool investigator named Margarita that's progressing pretty well. She's...kinda weird. She used to live in Brazil and go to Brazilian churches, so...she needs some help adjusting to the real world and the true gospel. Everything is so...mystical in those churches. I can't really describe it. I can see why people go there, but...they seem to come out so confused afterwards. She's doing well though. She wants to get baptized. We just need to make sure she understands what she's doing. So yeah. Everything's well with my comp (He's from Santa Cruz, by the way) and the ward and the work. I honestly don't know what to say about this week. We're just focusing on finding more investigators. We found a few this week, but...nothing to write home about, as they say. Probably the biggest thing this week is that I'm getting closer to hitting another landmark. We're now in August. I feel so old in the mission now. Supposedly this week or next, I get the 创Trunky Call创 when I have to tell what airport I'm flying to and all my home information and address and such. Also, this is the last change of the sister missionaries who came to the mission with me. And one of them, Hermana Campos, is in my district, so that's making me feel old too. Oh well. Luckily, I'm really happy here, so my old age doesn't bring symptoms of trunkiness and looking forward to going home. That's not allowed yet. Sickness: Meh. Mas o menos. I have a runny nose every once in a while, but nothing more. It hasn't affected me yet. Probably won't, just like last year. I was always on the point of getting sick and I never did. Hope everything keeps going well with the move. If I happen to be in town that day, call me and I'll come over and help. haha.